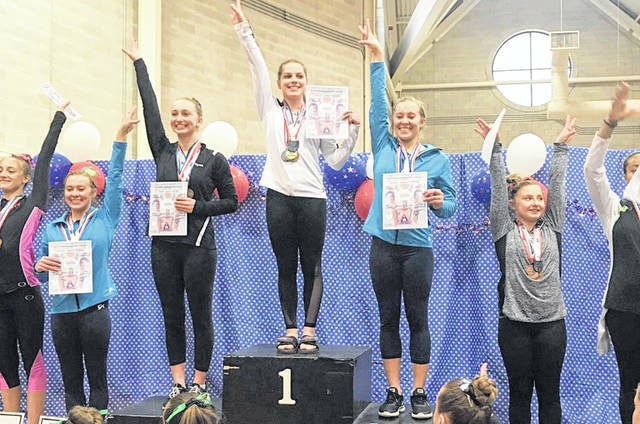 Wilmington’s Emma Geggie won the Senior B Division Level 9 all-around state title Sunday at the Ohio USAG Level 6-10 State Championships at Bowling Green State University’s Perry Fieldhouse. A junior at Wilmington High School, Geggie posted a personal best 9.625 in winning the overall vault championship. 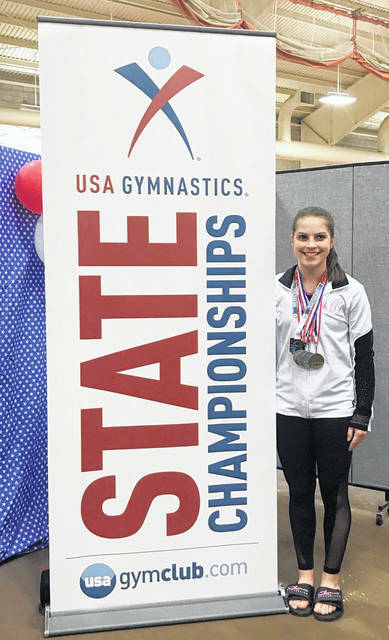 With the state title under her belt, Geggie moves on to the USAG Women’s Region 5 Championship tournament April 11-14 at Kellogg Arena in Battle Creek, Mich. where she will vie for a spot on the U.S. National Team in May. Geggie competes with the Queen City Gymnastics team out of Cincinnati. At BGSU, she was state runnerup in the uneven parallel bars with a 9.075 score and runnerup on the balance beam with a 9.175. Geggie was 11th overall on the floor exercise, posting an 8.625 score. Her all-around total was 36.50. The Women’s Junior Olympic National Championships will be held May 18-19 at the Indiana Convention Center. There, gymnasts are vying to become Junior Olympic national champions in the all-around, as well as in all four events: vault, uneven bars, balance beam and floor exercise. USA Gymnastics has eight regions, and the top seven gymnasts in each age division from each region’s Regional Championships advance to nationals. The winning Regions will also be determined at the conclusion of the competition. The top four all-around athletes in each of the twelve age-divisions are named to the 2019 Junior Olympic National Team. The U.S. Junior Olympic National Championships is one of the national championships of USA Gymnastics, the sport’s national governing body in the United States.